I started seeing Marti in July of 2015. I didn’t have a significant weight problem, but I could never get that layer of fat off and figured I was stuck with it. My husband and I both participate in triathlons, and I was never terribly competitive because my times were never that great. Then came Marti and her PNC. Let me start out by saying that if you give me a formula and a plan, I can stick to it easily. And I did. What was interesting is the transformation. I’m 5’ 6”, and I believe I weighed 133 to 135 lbs at the time, 26% body fat. Within 10 weeks, I’d dropped to 122, about 11%! It was quite shocking to me, as my ideal weight was 125 – or so I thought (more on that in a bit). 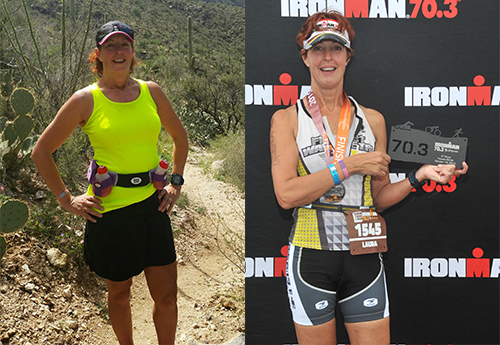 And then I did a half Ironman and broke the 6 hour barrier, coming in 3rd in my age group (I was 51). I couldn’t believe it! I’d never been on a podium in my life! But what I realized at the time was that without all the extra weight, I could run faster (I don’t know how much to attribute to the weight factor for the swim or the bike – on the run is where I really noticed it). The next thing that happened was that I actually started strength training. And all of a sudden, with all that activity level of training for races plus the strength training, my muscles started getting bigger due to all the extra protein (the RIGHT amount of protein given my activity level). My weight started to increase again. But this time, I didn’t gain any fat. This time, although I went back up to 130, I was still at approximately 10% body fat (by caliper – I think closer to 13-15 in a dunk-tank test). And I felt great! I have maintained this level of body fat / lean body mass for a year now. And I discovered it’s not about weight, it’s about proportion. That 125 number was never realistic. This is NOT a diet. It’s a way of eating the proper proportion of protein, carbs, and fats to be healthy, and eating enough times throughout the day. Anyone can do this with enough discipline, and you won’t be hungry. All I can say is that triathlons are just that much more fun these days!